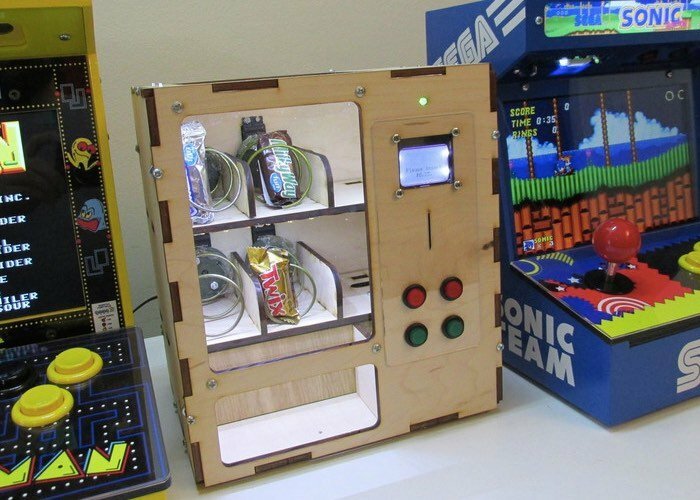 If you have ever fancied having your very own vending machine at home you might be interested in a new DIY project which has been created by Ryan Bates that allows you to create one using a little Arduino hardware and programming together with a few laser cut pieces to create the case. Check out the seven minute video below to learn more about this desktop vending machine and how you can use it to vend almost anything. The vending machine aptly named the “Venduino” has been equipped with 4 input buttons to make a selection, an LED indicator, and a 12V light strips to illuminate the inside of the cabinet. Whether it’s candies, toiletries, game cartridges, or miscellaneous items you’re looking to dispense, the possibilities are endless. Simply insert a coin, choose a product, and repeat. For more information on the new Venduino and to create your very own jump over to the Retro Built Games website for details, code and schematics by following the link below.